Amino acid blend designed specifically for Large Polyp Stony (LPS) corals. 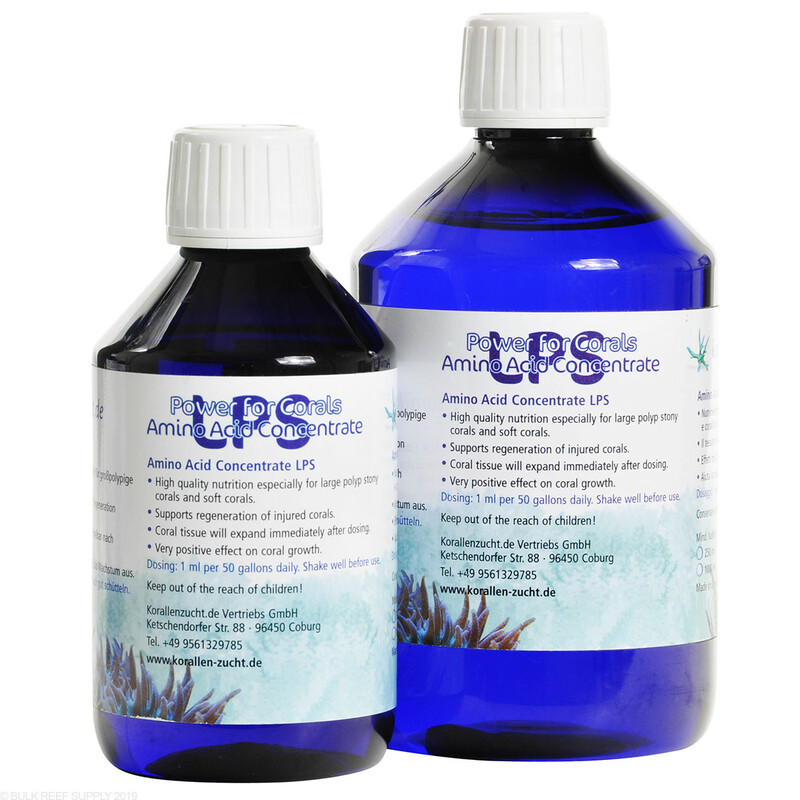 A high quality amino acid based food source for LPS corals: including Catalaphylia,Cynarina Blastomusa, Heliofungias, Welsophylia, Musidae, Symphylia and Fungias. Upon dosing, corals expand their tissue immediately. Regular dosing will increase growth as well as the regeneration of damaged corals. This product is particularly useful in helping corals acclimate during the initial stages of implementing any low nutrient system. Recommended dose is 1ml per 50 gallons per day. If you want to get the best out of your coral, this Amino should be part if your dosing routine. I use this, Kent marine coral vite, and phyto. I also target feed reef chili twice a week. This is my winning combination and my coral are flourishing. I decided to put my dosing regimen to the test and bought an Ora neon green birdsnest frag from the $5 section at my LFS. It was thin, and had almost no zooxanthellae left. In two weeks it's completely turned around. The frag is full, the zooxanthellae is coming back and I'm already getting new skeletal growth. I know this is for LPS and Softies but I honestly don't think if would have gotten as positive of a result without it. I have a mixed reef nano. First dose a few days ago saw the corals react by shrinking and closing up for a while but they opened back up within a few hours. Since then, the corals have reacted positively and have been opening up much larger. I have a dozen torches and hammers, 2 blastos and a candy cane coral. I am dosing only about 2/3 of the recommended dose and the corals seem happy. I maintain 0 nitrates and 0.05 phosphates and I started feeding Reef Chili so we shall see how fast the corals grow. So far I can say I am impressed with this product. I have a hard time keeping nitrates up in my tank, and my corals tend to suffer sometimes because of it. This product really works well with my LPS - especially my lobo. The heads get nice and plump after using this and growh has increased. I keep a well maintained and established 69 gal Red Sea max with sump, and have had luck and ease with Sps growth and coloration but stuggled with soft coral extension and growth. After 10 days of dosing half cap a day almost all of my soft corals have quadropled in size/ heads and the extenders extend much much further which makes it easier for them to catch frozen mysis shrimp during feeding. It took about a good week before this product started to work and you could actually notice a difference. My Frogspawn, Octospawn, and my Hammer corals start to blow up big after about the 10th day. HIGHLY recommend for LPS corals and my T-Maxima Clams.. 5 stars across the board and his is the only supplement that I add along with my phytoplankton to my Mixed Reef / LPS dominated tank. This product works great. My splatter hammer coral was not extending its polyps the way it did when I first bought it and looked like it was receding. I dosed this product and they extended more immediately after dosing I really didn't believe it. It's been over a month now and it's doing really well. I bought 2 other KZ products before and had mixed reviews of it so I was skeptical of this but it really works well. I'm trying to dose this every other day since I manually do it. I have a ten gallon so plan to do 0.4 mabye 3-4x weekly. My LPS and softies seem to respond well. My corals love this stuff especially my Duncan coral, a little goes s long way, I purchased the small kit but I will order the larger bottles when I am out because I can really tell a difference. I have to say been dosing Reef Energy A and B and this stuff coupled with their LPS it truly makes a difference. Will be dosing these daily now via doser now as my go to. I have been using it for a few weeks now and my few LPS have responded well. My frogspawn polyps now are so extended that the edges reach out almost 3/4 of an inch to an inch from the stem top. They were not doing that before. What is the shelf life for this product? Do I need to refrigerate it? Great question! Amino Acid Concentrate has a shelf life of 24 months from the date of manufacture, we recommend refrigeration after opening. How often should I dose this? Do I need to turn the skimmer off before dosing? The Amino Acid supplements should be dosed on a daily basis. You should not need to turn off your skimmer as they don't generally impact most aminos in any significant way.